You came to the right place for all style of D-Force Wheels! We stock nearly all sizes and finishes to provide you with quick shipping times and the LOWEST PRICES OUT THERE! On this page you will find all of the D-force wheel options that we carry. D-force wheels were designed to be lightweight and affordable. This combination yields increased vehicle speed at a reasonable cost. Paying less for rims does not mean that you have to sacrifice aesthetics. At modbargains.com we carry two variations of the D-force wheel, the LTW5 and the Empower. Each variation is available in a unique finish that adds style and class to any BMW. Lighter, stronger wheels can greatly enhance vehicle speed. Loosing 1 pound in wheel weight is equivalent to 10 pounds of vehicle weight loss! By installing D-Force wheels on your BMW you are saving money and using some of the lightest, strongest wheels on the market today. Click on the two D-force wheel options below for fitment specifications, design options, discounted prices, and BMW compatibility. To make each D-Force wheel so light and affordable, a unique production process called "Flow Forming" is employed by the manufacturer. The process begins by casting the center area of the wheel in a low pressure mold. This mold is removed, pressed and heated while being spun in a CNC machine. This process results in the barrel area aluminum being thinner yet much stronger than aluminum that did not undergo this process. You are left with a stronger wheel that was made using less materials. This translates into a D-Force wheel with lighter rotating materials for faster vehicle performance. Flow Forming technology produces many benefits for our D-Force wheel customers. 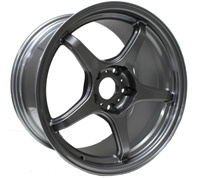 The manufacturer has the ability to produce these wheels at two thirds less cost than fully forged wheels. By purchasing D-Force wheels these savings are passed on to you. The heat treating portion of Flow Forming increases wheel strength without the use of extra alloy's, resulting in a dent resistant D-force wheel. The D-Force Empower, on average, is 7 lbs lighter than its closet's competitors! Need Help Installing Your New D-Force Wheels? Our installation and tech center is located at the modbargains offices in La Habra, CA. Visit our installation page to schedule an installation date and to receive a quote for your new D-Force wheels. At modbargains.com we offer four stunning finishes for the LTW5 D-Force wheels, bronze, matte black, anthracite, and silver. The Bronze Age was marked by many great advances in technology and flourishing civilizations, emulate this period of excellence with a bronze finish. Matte black gives your BMW a sleek professional look, once you hit the gas pedal people will finally understand your business like mentality. Anthracite has a coal like appearance with added luster. Silver D-Force wheels are timeless. The Empower D-Force Wheels are available in silver, chrome, and anthracite. We will ship your D-Force wheels anywhere in the United States (excluding Hawaii and Alaska) for a $99 flat rate. If you are located outside of the United States (Hawaii or Alaska included), email us at [email protected] so we can provide you with a quote.